My Son really loves the Diary of a Wimpy kid books...last year we went to see the movie called Diary of a Wimpy Kid Dog Days...it was a really great movie... my son was also really excited as the Author Jeff Kinney was also going to be there doing book signings..we had to queue for a while..but my son really enjoyed meeting him and getting his books signed. 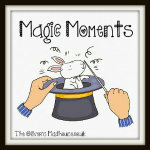 Please click on the badge above to share your #Magicmoments. He looks so relaxed! What a great moment. I really look forward to my kids being old enough to have favourite authors. How lovely to get to meet a favourite author! Good when children's books have a meaningful impact.